Dessert and a show. That’s what’s on tap at a dessert destination with the quirky name of Three F(x) Ice Cream & Waffles in Jacksonville, Florida. The three “F”s are “fresh” for coffee, “fruits” for ice cream, and “fun treats” for waffles. I found this to be a bit “flaky,” for confusing. Not needing coffee, I went for two “F”s, with the “fun treat” waffles actually being taiyaki. This Japanese street food, which literally translates to “grilled sea bream,” is a pancake-like sandwich in the shape of a fish that is generally filled with red bean paste. The Korean owners of Three F(x) make them to order, pouring batter into taiyaki pans and offering more than a dozen fillings. While there are a couple of savory options like beef frank with string cheese, the sweet options prevail—from nutella to “cream cheese cream” to apple cinnamon. I opted for Taro Taiyaki ($2.45), and per personal (though fairly common) tradition, bit off the head of the fish first. Inside was the taro’s captivating purple color, but also a layer of what the taiyaki-maker called egg and cream cheese. Custardy, I’m guessing it was the aforementioned cream cheese cream. 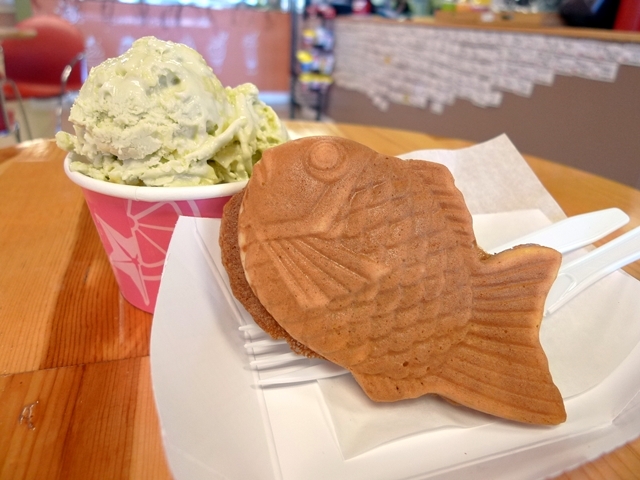 Luckily, the earthy and nutty flavor of the taro wasn’t completely lost, and the taiyaki brought back memories of enjoying the crisp pastry treat on the Japanese streets. Meanwhile, a worker will make ice cream fresh in front of you at another station that features an “ice pan” which freezes to -35°F. You get a choice of milk (whole, soy, non-fat) to which you add your desired flavor—including various berries, other fruits, mint, espresso, and of course vanilla and chocolate. Staying with the Asian theme, I chose Green Tea Ice Cream ($4.65, small). The blended mixture gets poured in a crepe-thin layer onto the frozen pan. It starts to freeze instantly, so the worker mixes and manipulates it with two putty knives until it solidifies to the right consistency. Asked if I wanted a fruit topping or two candy toppings (included in the price), I selected pineapple, thinking I’d eat it off the top of the ice cream. When it turned out to be a mix-in rather than a topping, I knew I was in trouble. Green tea and pineapple wasn’t a great combination. The green tea flavor was rather weak, and while not as dry and grainy as I expected from what I saw, the ice cream lacked the rich creaminess I crave. Still, it was a fun show to watch, and given that everything’s made fresh, I wouldn’t hesitate to return to Three F(x) for the refreshing chance to try taiyaki again in an unlikely location far from its native land.